In case you thought that Fox News might be joining the rest of us here in the 21st century this year, this segment should remind you that some things never change. 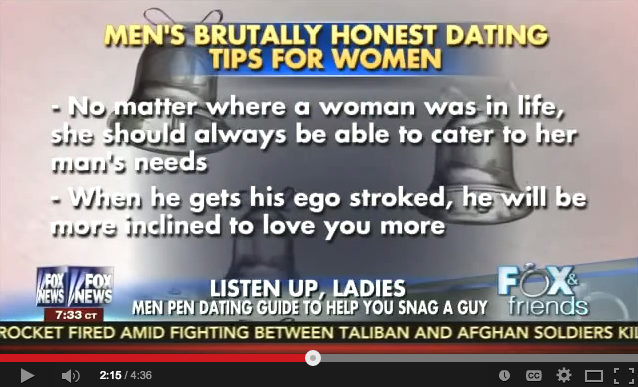 Whatever happens in 2015, you can count on Fox to partake in the long tradition of telling women how they’re failing at the most important quest of all: finding and keeping a husband. Affordable housing. With hair like this, you don’t need a roof over your head. Sixty US veterans from the Truman National Security Project have written an open letter to Fox News’ Eric Bolling and Greg Gutfeld over their oh-so-funny jokes about Major Mariam Al Mansouri, the female UAE pilot who led airstrikes in Syria. How many more times is the media going to fall for GOP Obamacare lies? It’s like deja vu all over again! This week the nonpartisan Congressional Budget Office released a report with new analysis of the impact of Obamacare on the economy. The report, which analyzed the economic outlook from 2014-2024, concluded that Obamacare will cause a reduction in the labor force by the end of 2024. 2.3 million workers will drop out of the labor force either by deciding not to work or reducing their hours. Apparently, retiring early sounds a lot better than pulling double shifts at a thankless job so you can keep your health insurance. 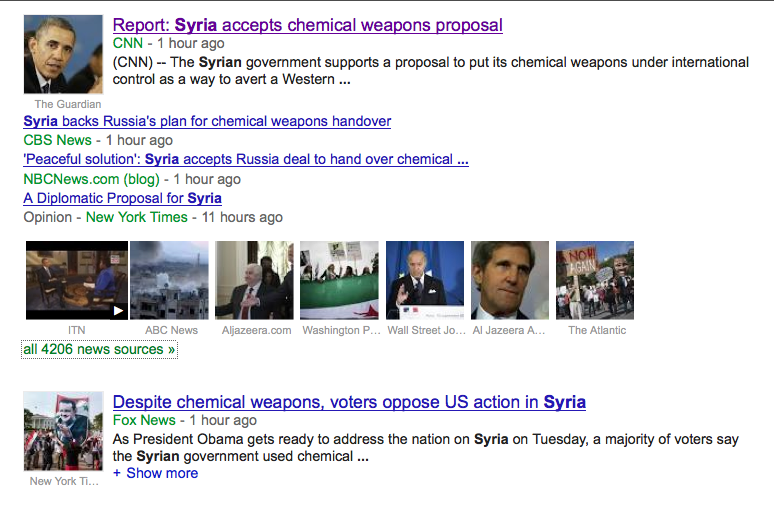 Speaking of Syria, the following screen shot of a google news search for the term “Syria” shows how different media present the news about a potential diplomatic solution to the Syrian crisis. As you see, CNN and CBS emphasize the fact that Syria has said it will hand over its chemical weapons; NBC stresses the “peaceful” nature of the development and The New York Times refers to the diplomatic nature of the deal. Fox News, for its part, acts as if nothing new has happened. It basically says, what is wrong with you people! How can you oppose a strike on Syria when there are chemical weapons there? Thanks for the informative and enlightening perspective, as always, Fox.